Last October, the “Promenteus 2008” awards were held in Salzburg. The prize is awarded to people and companies for their efforts in supporting the social integration of those who have made acquaintance with the darker side of life. 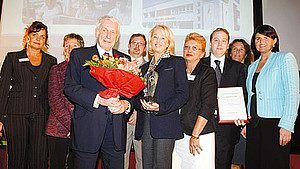 The Promenteus honour award was presented by Salzburg’s provincial governor, Gabi Burgstaller. She expressed her pleasure in the fact that an increasing number of companies, such as Wenatex, show a great interest concering social commitment. Incidentally, Wenatex is the only company to date that has received the social Oscar for the second time and we are pretty source that this will not be the last time.The Promenteus is awarded by Pro Mente. The prize is awarded annually to people and companies for their commitment and special efforts in employing and socially integrating people with impariments or handicaps. Particularly those people who have made acquaintance with the darker side of life should be given an opportunity to gain more self-esteem and experience a little happiness, which a professional restart could help to provide. The re-entry into professional life signals a light at the end of the tunnel for many, which changes their lives dramatically, but in a positive way. This is particularly demonstrated by our company.